It was a small and disappointed mob of fans who turned out to welcome hit UK band One Direction to New Zealand this evening. The group - comprising Harry Styles, Niall Horan, Zayn Malik, Liam Payne and Louis Tomlinson - arrived at Auckland Airport at 5.30pm but managed to slip out a back door without being seen. About 100 eager fans were desperately waiting to catch a glimpse of the teen heartthrobs, some camping out from 5am. The teenage crowd kept themselves entertained by singing the group's songs and comparing notes on their favourite members. Reminiscent of a scene from the 60s, the girls moved as a pack covering every possible corner of the airport with rumour of every possible sighting. In the end, the band were driven off the tarmac without being spotted but many of the fans vowed to continue trying to catch a glimpse of them over the next few days. Screaming teenagers have also stationed themselves outside The Langham hotel in central Auckland in the hope of catching a glimpse of the boy band. One Direction play two shows in Auckland on Saturday before flying to Wellington for a final New Zealand show. Since coming third on the UK version of X Factor, the group have gone on to amass more than 4.6 million Facebook fans and their video for the song What Makes You Beautiful has had more than 103 million YouTube hits. 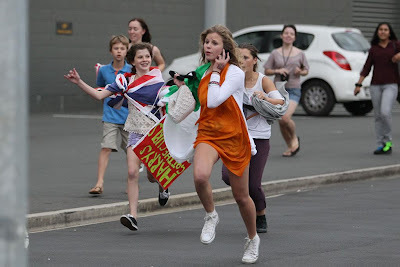 Fans run around Auckland Airport hoping to see One Direction as they fly in from Australia on Thursday. Photo: NZ Herald/Dean Purcell. One Direction, who are all aged under 20, sold out 80,000 seats in just 12 minutes in the UK earlier this year and beat Adele to pick up a Brit Award for Best British Single last week. 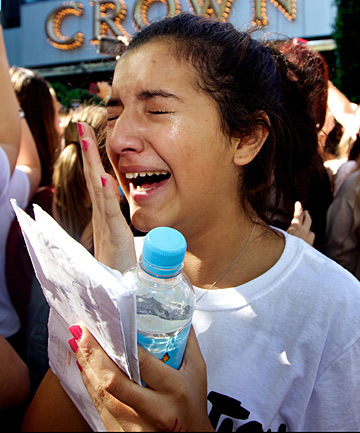 Their album Up All Night debuted in the top 10 in more than 15 countries. In New Zealand, tickets for the bands three shows sold out in record time - 10,000 tickets in under 10 minutes. Many fans were distressed as they then saw tickets on Trade Me minutes after going on sale for up to five times their face value. But to the relief of thousands of girls, the band last week announced a full tour of Australia and New Zealand in 2013. The exact dates or venues of the shows have not been confirmed.